Hey guys! Today, I am reviewing a cookbook I recently received. 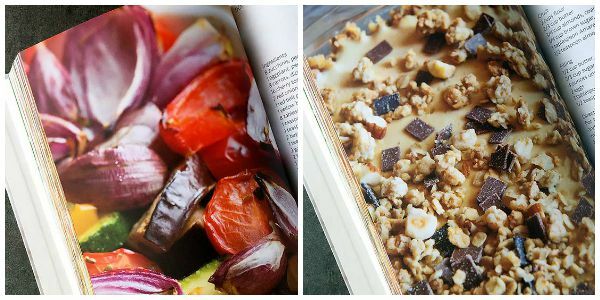 It’s called Domestic Chic, A Fashionably Fabulous Guide for Cooking and Entertaining. 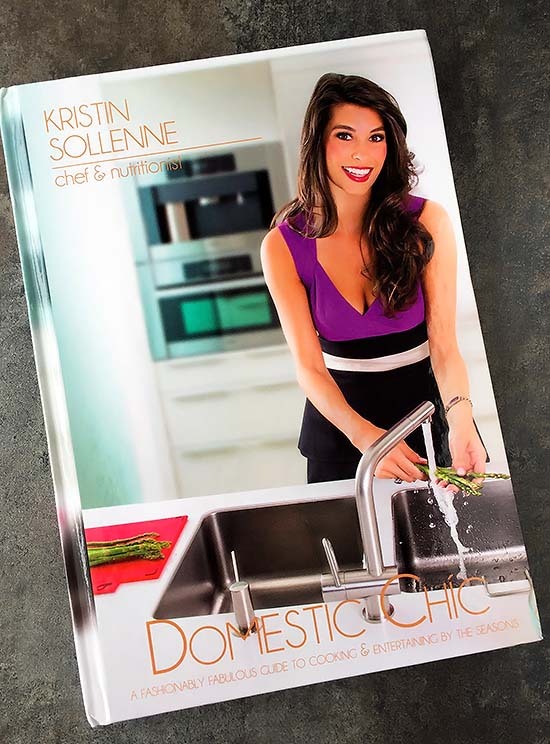 The cookbook author is Celebrity Chef, Kristin Sollenne. 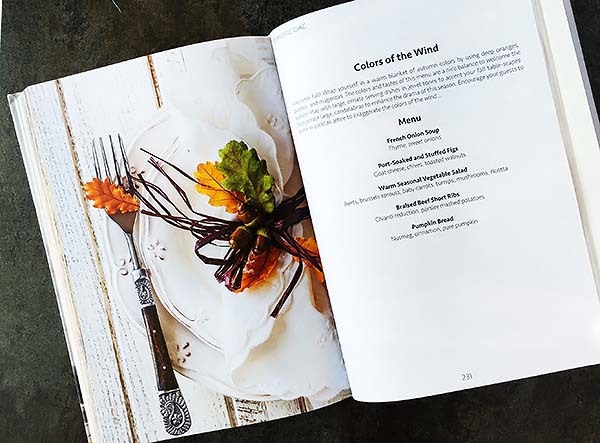 She’s a certified nutritionist, and the focus of the cookbook is flavorful and healthy dishes that are based on seasonal produce. Ms. Sollenne is a self-taught chef who has been on the “Today” show, among many other news programs. You may recognize her as a regular guest judge on Beat Bobby Flay. She’s cooked for several celebrities, including Taylor Swift and the cast of Saturday Night Live. As part of the New York City Restaurant Group, she oversees three kitchens. Chef Sollenne likes to focus her menu items around farm-fresh vegetables, herbs, lean proteins and olive oil. While growing up in California with her Italian-American family, she learned to create wholesome and flavorful meals with the goal of helping her parents lose weight. After her father had a heart attack, she worked hard preparing nutritious meals for both of them. Working with the NYC Restaurant, she has been bringing the California farm-to-table concept to traditional Southern Italian cuisine. Now that we’ve gotten a little background on the author, how about we get on to the review? There were a few recipes that jumped out at me right away and quickly found their way onto our dinner table. 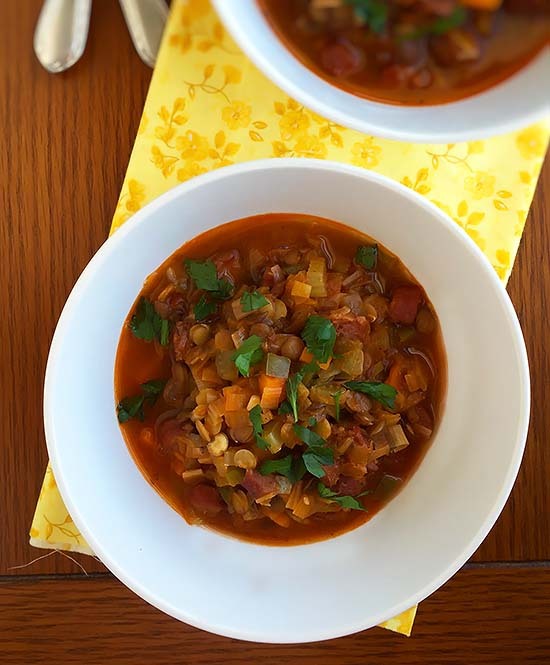 The Lentil and Sausage soup was very delicious and a hit with both my husband and I. The cookbook contains sixteen complete meal plans and over one hundred recipes. The meal plans are for a variety of occasions, like Mother’s Day and New Year’s. They are all based on what’s fresh and in season. For someone like me, who has a hard time pairing up different dishes, this could be a great resource. Also included with the meal plans, are easy and stress-free party planning and decorating tips. The recipes feature mostly real food ingredients, which do focus on fresh seasonal vegetables. Most of them seem pretty simple and like something an intermediate level cook could make. It’s full of pictures of the dishes, which I really appreciate in a cookbook. The added bonus is the fact that it takes all of the guesswork out of meal planning. Honestly, the only changes I would make to the recipes are things that easily adaptable. Things like switching low-fat or non-fat dairy products to whole milk ones and using unrefined sweeteners. Those are simple changes that are just my personal preference. Not a deal breaker, because I already do that with other cookbooks. The recipes I’ve tried so far are delicious and would make again. Who do I think this cookbook would be good for? This book can be for the lady or guy who loves to entertain friends and family. The person, who loves to have friends over for dinner, but struggles with planning meals. But it also has several great recipes that would be good for just a regular night at home. Domestic Chic, A Fashionably Fabulous Guide for Cooking and Entertaining will hit bookshelves this Friday, September 4th. You can order a copy on Amazon here. Now, I know you are all ready for the exciting part. I was given the opportunity to give away a copy of Domestic Chic! Yay for giveaways! Disclosure: I received a free copy of Domestic Chic in order to review it. The opinions and thoughts expressed are honest and unbiased. By Tempie at September 10, 2015 .